The technology utilizes lenses that focus on the waves produced from the infrared energy that can be detected in all objects onto an infrared sensor arrangement. The energy is transformed into electrical signals creating a video image. 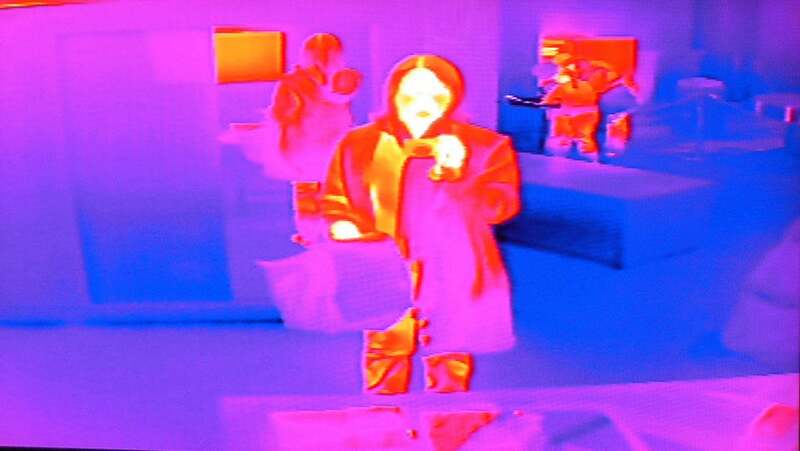 Relative to the object and its surroundings, the infrared camera generates a thermal profile. The warmest areas appear white, creating a distinctive appearance, making it easy to identify various objects. Thermal technology aided the police in their hunt for the 19-year-old Dzhokhar Tsarnaev, Boston marathon bomber, in 2013. After determining traces of blood and what seemed to be body in a boat, authorities used a helicopter fitted with a thermal imaging device which proved it was in fact the suspect’s body. The technology succeeded in detecting the heat radiating from the 19-year-old, despite being under the cover of the boat. As named by the Duchess of Cambridge, the Grand Royal Princess Cruise liner, worth £470m has been equipped with sophisticated security features which includes specialist helmet technology to protect against fire, as well as a thermal imaging camera which is used to search for overboard casualties and to provide assistance when identification of aggressive approaches by gangs and dangerous sea pirates is required. Slough Borough council has assessed that up to 3000 people are living illegally in the town and as a result of these figures, have recently sent up an aircraft with thermal-imaging cameras to detect any heat being emitted from out of unlicensed buildings. Over 200 alleged illegal dwellings were found during a two hour flight and the process is anticipated to be rather frequent to find even more suspects. Police officers along with a thermal imaging camera fitted helicopter were sent to inspect the scene, when a member of the public claimed to have spotted a white tiger hiding in a field in Hampshire, UK. The thermal imaging camera ultimately detected that there was no heat radiating from the target area and when the object rolled over from the impact of the landing, the helicopter it revealed it was in-fact a life-sized tiger toy! Thermal imaging cameras were used to save survivors from the recent Japanese earthquake and tsunami. Video cameras were positioned on the end of flexible poles and squeezed through openings in the rubble to help detect survivors as their body heat warmed the rubble in close proximity them. The technology saved precious time, as searches could be conducted proficiently during complete darkness, sunlight and severe weather conditions. It also meant that less time was consumed shifting unnecessary rubble, permitting victims to be rescued in the shortest time possible. Ford engineers are currently use thermal imaging technology to recognize where air is escaping from a vehicle. The technology allows Ford to test a variety of different ways of how they can contain air within the vehicle, by varying the design and use of insulating materials. This is very advantageous to such engineers as preventing air leaks reduces noise as well as develops heating and cooling efficiency, which consequently reduces energy loss.